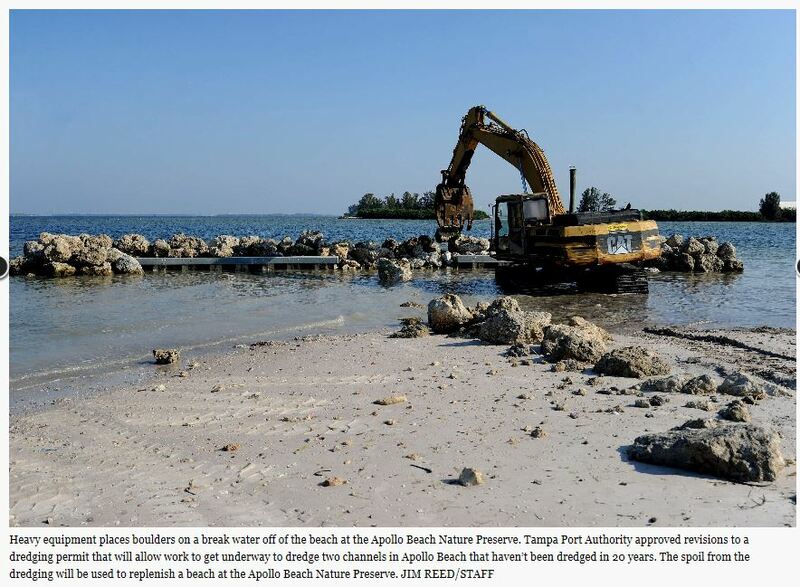 APOLLO BEACH — South County should soon have its beach back, one of the few recreational shorelines on Tampa Bay’s eastern side and a decades-old perch for sun bathers and sunset oglers. And area property owners should again have unimpeded paths on which to navigate large boats into the bay. The Tampa Port Authority board last week, approved modifications to a dredging permit, one of four permits needed for the project, and one of the final steps toward completing the task. Once the work is done, three channels leading to the area will go from about 4 feet in depth to about 71/2 feet deep at low tide, opening up access for yachts and sailboats that right now have to wait for high tide to get in and out of the area. The project to replace the eroded shoreline at the 60-acre Apollo Beach Nature Preserve and dredge nearby channels for boaters is not just about lifestyle, however. It’s also about property value, prompting some big guns to donate toward the effort. Erosion has taken most of the two-acre beach at the nature preserve and the three channels leading into nearby residential areas haven’t been dredged in two decades. Hillsborough County kicked in $850,000 to construct breakwaters around the park meant to keep erosion at bay and also donated $50,000 toward the channel dredging. But the real responsibility for channel maintenance lies with area property owners. To get the work done, nearby land owners had to come up with $300,000.